North American Indians Kaiowa believe that they came to this world through the body of the tree. On the way they met their ritual doll Tai-me, it told them how to live in the endless prairie, observing Manitu rules and not to disturb the balance in the Nature. So Kaiowa for many centuries carve Tai-me from the wood and pray to it as a symbol of all deities and spirits inhabiting the Earth as per their assumption. Every Indian tribe has its own story of human origin, often even separate kins have their own legends about this. Many Indian tribes descend from various animals, which transformed to the human being for many generations. The animal - ancestor became a totem. 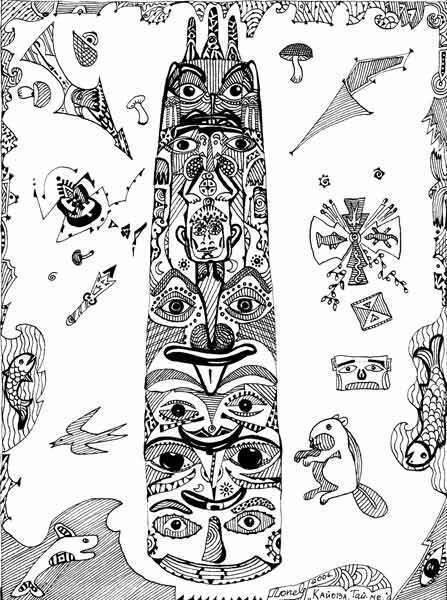 They often carve totem image from the wood, it depicts all the ancestors of the kin, starting from the animal and ending with the first human chief. The first ancestor - animal is always carved first, if it is an eagle - on the top, if jaguar or beaver - down below. All stages of transformation are depicted in details for descendants do not forget who were their ancestors. Most often you could encounter strong animals as ancestors: eagles, jaguars, bears; but there are tribes and kins descended from weak but smart animals. There are honored tribes and kins descending from beaver or hare, squirrell or bat.